When the snow fell on Wednesday, it took Brandon Vanhee more than an hour to make the 15-mile trek from his home in Otsego to Maple Grove’s Parkway Transit Station. The rest of his journey to the University of Minnesota wasn’t nearly as difficult. After riding express Route 785 to downtown Minneapolis, Vanhee caught a Route 50 bus that took him across the Washington Avenue Bridge to Jones Hall, a longer but much more efficient leg of his morning commute. “It took way less time for me to go a lot further after I caught the bus,” Vanhee said as he traveled to campus on Wednesday, again on Route 50. 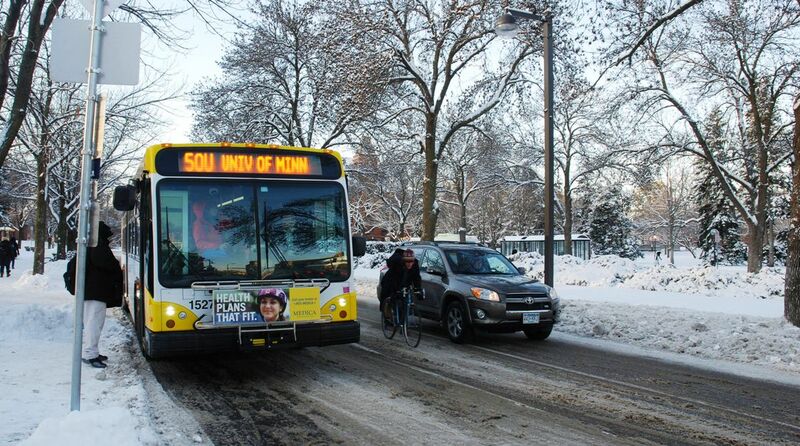 Such convenience was among the many reasons customers say they ride Route 50, which runs between downtown Minneapolis and downtown St. Paul, serving the U of M and a nearly seven-mile stretch of University Avenue. Customers riding this week also said they used the bus to avoid paying for gas and parking, which comes at a premium on campus and in both downtowns. 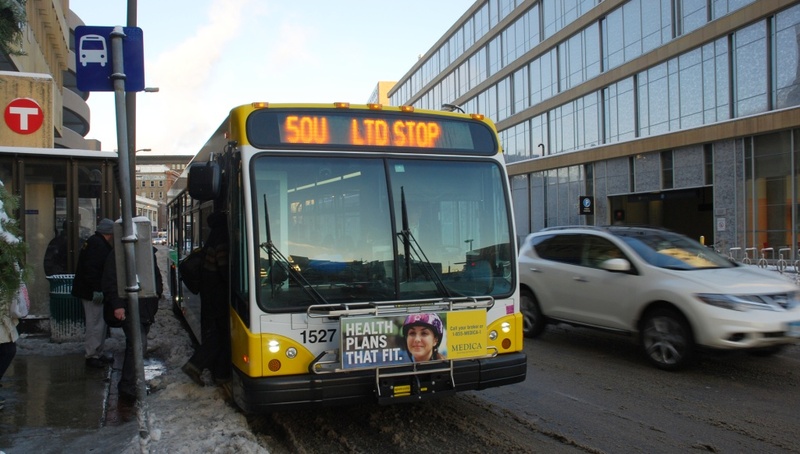 “I’m reminded of that (the savings) every time I fill up,” said Jessica Mattson, who has used the Route 50 to get from downtown Minneapolis to the U of M nearly every day for the last six years. 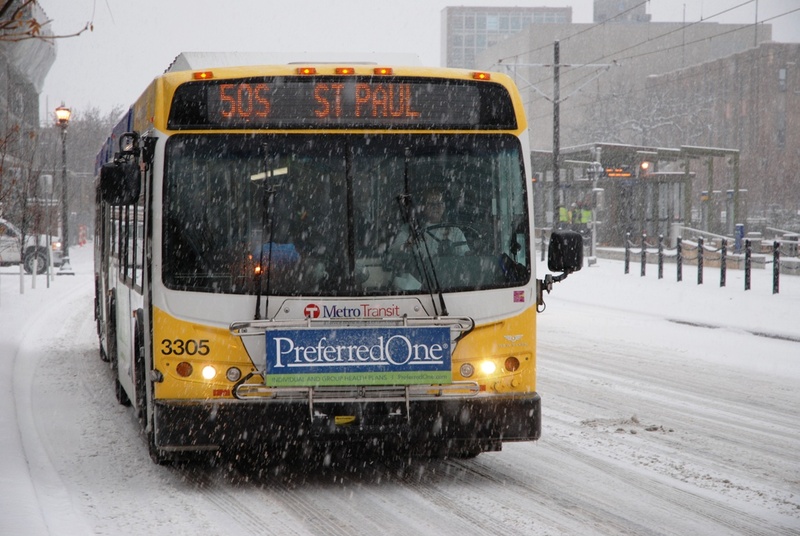 Customers traveling longer distances between downtown Minneapolis and downtown St. Paul also gravitate to Route 50 because it is a speedier alternative to Route 16, which travels an identical path but makes nearly twice as many stops along the way. An end-to-end trip on Route 50 takes approximately 50 minutes, compared to an hour on Route 16. Donny Crow, who lives on St. Paul’s east side, said that efficiency is why he prefers taking Route 50 when the option is available to him. Crow takes Route 64 downtown where he catches Route 50 to get to his job near the intersection of University Avenue and Oxford Street. The idea of a faster trip on University Avenue began around 1920, when limited-stop bus service was introduced to compete with streetcars on the corridor. The service was eliminated when buses began using Interstate 94 in the 1970s but returned in 1998 with the introduction of Route 50. Route 50 buses initially ran every half hour but today run as much as every nine minutes during rush hour, matching Route 16’s frequency. After 15 years in service, Route 50 will be replaced in 2014 by the METRO Green Line, which will travel a similar path as the 16 and the 50. The train is replacing Route 50 because it will serve many of the same destinations as Route 50 with better travel times and much greater capacity. John Levin, director of service development for Metro Transit, helped create Route 50 and said its departure is bittersweet. The Green Line will bring all day, high-frequency service to the corridor while planners turn their attention to the next iteration of limited stop service – Arterial Bus Rapid Transit. The Arterial BRT concept aims to bring quicker, limited-stop bus service to up to 12 corridors, beginning with the A Line on Snelling Avenue in 2015. Before it is replaced next year, Route 50 will be among several routes that return in December to Washington Avenue, on the U of M campus. Buses have been detoured because of Green Line construction but will now use the Washington Avenue Transit/Pedestrian Mall between Pleasant and Walnut streets. Thuylinh Vuong, a first-year student at the U of M, is among those who are happy to see Route 50 and other transit service to the more centrally-located Washington Avenue. “It will be nice to have it back on Washington because that’s where I spend the majority of my time,” Vuong said. Service: From Minneapolis, Route 50 runs east from the Ramp B/5th Street Transit Center to the University of Minnesota, University Avenue and downtown St. Paul. Route 50 buses run from approximately 6 a.m. to 7 p.m. on weekdays, with service as much as every nine minutes during rush hour. In the late morning and early afternoon, service is more limited with trips running primarily between downtown Minneapolis and the U of M. Route 50 follows the same path as Route 16 but offers limited-stop service between the U of M and downtown St. Paul. With nearly half as many stops, the end-to-end travel time on Route 50 is reduced to approximately 50 minutes, compared to an hour on Route 16. Ridership: Route 50 saw nearly 1.3 million customer boardings in 2012, with an average of around 5,000 customer boardings per day.Combined, routes 16 and 50 account for about 10 percent of all rides on Metro Transit's urban bus service. History: Streetcars ran on University Avenue between 1890 and 1953, when they were replaced with buses. Route 50 service dates back to about 1920, when the first limited-stop buses began running on University Avenue, competing with streetcars. Twin City Rapid Transit bought out the competition in mid-1920s and continued to run the service until the 1970s, amid the advent of express service between St. Paul and Minneapolis on Interstate 94. Limited-stop service on University Avenue returned in June 1998 with the creation of Route 50. Service was initially offered every half hour but was quickly expanded to every 12 minutes. Future: Route 50 is among the routes that will use the Washington Avenue Transit/Pedestrian Mall beginning December 2013. Route 50 will be replaced by the METRO Green Line when it opens in 2014. Route 16 buses will continue to operate every 20 minutes between downtown St. Paul and TCF Bank Stadium.